SAP Integrated Business Planning: Do you know your options? The release of SAP IBP 6.0, just around the corner, will contain the first release of SAP Integrated Business Planning for Supply and Response. This will be a landmark in the development of the IBP, introducing order level planning capability to the suite. As a result SAP customers will, for the first time, be offered real choices in how they develop their planning application capability. However with choice comes uncertainty, this is especially the case for those who currently run SCM-APO and have developed their supply chain planning processes around this tool set. These organisations should not be alarmed, SAP has committed support of SCM-APO as a component of business suite until at least 2025. However customers should not expect widespread innovation or enhancement. SAP’s vision for IBP however is far broader than delivering a turbo charged version of APO running on HANA. When complete the toolset will, for the first time, provide the basis to integrate strategic, tactical and operational planning, facilitating “full business planning”. IBP is constructed of five modules, two of which; IBP for Sales and Operations and Supply Chain Control Tower, provide end to end planning and monitoring capability. These tools are aimed at supporting management decision making and control, setting the direction for operational plans and supply chain execution. Unsurprisingly, these are also the two modules that SAP focused on first when developing the product. Those familiar with SCM-APO will know that this type of decision support is not a strength of the tool, the ability to quickly model alternative options, understand the financial impact and the resulting KPIs are all near the top of the list when clients discuss what they wanted from their APO implementation but have struggled to achieve. The reality is APO continues to offer strong core operational planning engines, but is limited and has fallen behind competing products, in terms of decision support, analytics and the user experience. In terms of capability to model large, complex supply chains and to quickly and consistently navigate through multiple views of the high volumes of data SAP recognised the advantage of waiting for the HANA architecture to be available, now that it is they have addressed these historical weaknesses head-on with Supply Chain Control Tower and IBP for Sales and Operations. The first thing users will notice with SCT and all IBP modules is that the browser based interface is transformed from the cluttered interface that ECC and SCM users are used to. It is much more akin to a consumer IT interface, suitable for occasional as well as regular users. The control tower is designed to collate data and events from across the extended supply chain, from planning and execution applications. Giving supply chain controllers an insight both upstream and downstream and across multiple markets and regions within the enterprise. As well as configurable KPIs, alerts are provided to trigger analysis and case management tools available to track interventions. IBP4 released in early 2015 heralded the arrival of a much more complete, mature version of IBP for Sales and Operations. The application allows organisations to model their existing S&OP processes and configure dashboards and analytics to support each step of the S&OP decision making cycle. 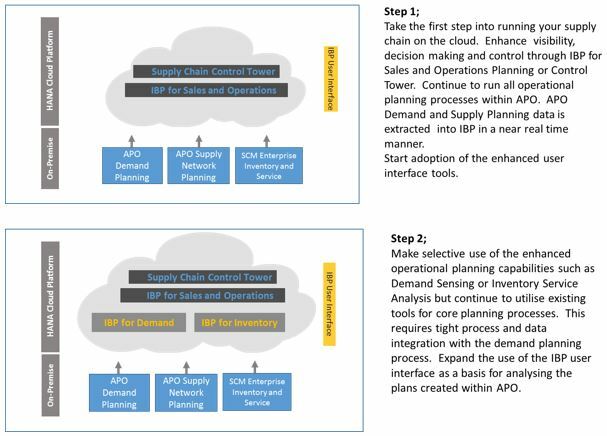 As well as integration to SCM-APO, and ERP systems to extract operational planning data, it is possible to generate and evaluate demand and supply plans on the fly (Readers should refer to OSS note 2076414 for guidance on the applications required to support this capability). In the majority of use cases this will be at an aggregated level, over a longer term horizon, aimed at supporting the strategic and tactical decisions made within S&OP. However the HANA architecture allows data to be stored at the level of granularity required to be consistent with the operational plan. Simulation capability along with the ability to model the top and bottom line impact of alternative decision options sets the product apart from the any SCM-APO or BI based S&OP support tools. In addition SAP’s collaboration tool JAM, is integrated offering the capability to manage and record the decision making workflow allowing the full S&OP meeting cycle to be systemised. JAM is however licensed as a separate application. 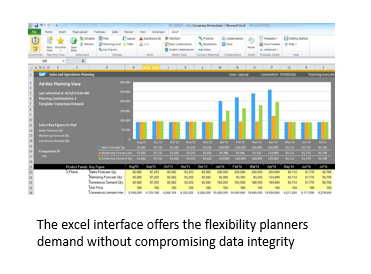 In terms of the planner’s user experience IBP for sales and operations offers an Excel based user interface for the detailed planning work, data from this interface is stored directly in the IBP HANA data model, offering the presentation style and flexibility that planners demand without compromising data integrity. 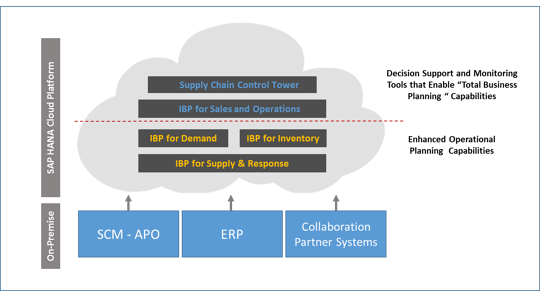 Whilst IBP for sales and operations and Supply Chain Control Tower are both now complete, “customer ready” products they are in the early stages of their lifecycle, customers should not underestimate the effort required to establish integration to mature SCM and ECC systems and to develop a well-tuned, process orientated data model. Beyond Supply Chain Control Tower and IBP for Sales and Operations the differentiated capability of the remaining IBP modules is much less clear, these all directly address functions that are already addressed within SCM-APO or within Enterprise Inventory and Service (formerly SmartOps Inventory Optimisation). 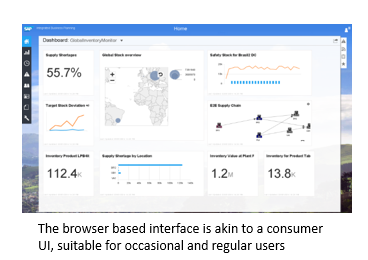 There are specific enhanced capabilities in all areas, and the browser UI combined with the Excel plug-in, which is available in all modules will appeal to many customers. However these modules are either in their first complete release or are due to become available for the first time in IBP6.0, therefore customers who run demand and supply planning within SCM-APO should take care that they do not lose capabilities which are tried and tested. For these customers the option exists to pick and choose selected additional capabilities as they mature, but in the short term continue to run core operational planning processes within their SCM-APO environment. 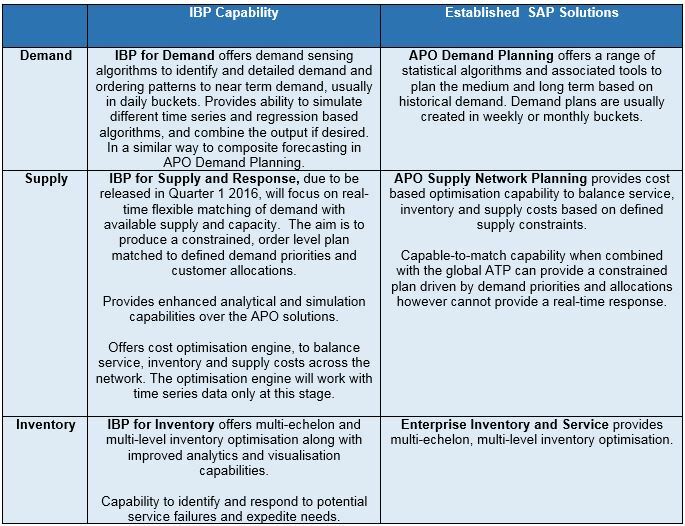 The table below summarise the key differentiated capabilities for IBP for Demand, for Inventory and for Supply and Response with alternative, more established SAP solutions. This summary reflects the anticipated solution capability as of the release of IBP 6.0. It is expected that IBP capability within operational planning will develop significantly in subsequent releases throughout 2016 and 2017. Of course one of the key choices facing customers is whether they wish their planning applications to run in the cloud or to run in an on-premise solution. IBP is only currently available as a cloud service whereas the majority of the established SCM and EIS solutions are deployed on-premise. So where does this leave SCM-APO customers? First and foremost the developing maturity of the IBP toolset, combined with the SAP’s commitment to SCM through to at least 2025 means their customers have choices. Those who identify which elements of IBP offer them a step change in capability and as a result are able to take a step towards “full business planning” will steal a march. It is likely that greatest advantage is to be gained from improved decision support tools followed by selective enhancement of the core planning capabilities. 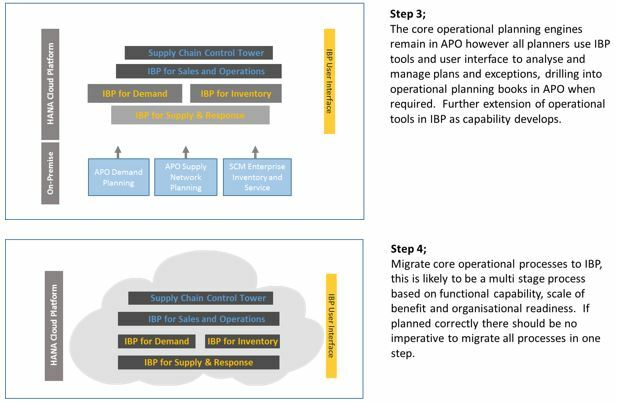 It could be a number of years and several releases before the migration of operational planning processes to IBP becomes an option for those with complex supply chains and advanced tools today. In the end state it is quite likely that some of the very near term functions, such as short term schedule optimisation will continue to be supported outside of IBP. Therefore the ability to weave these processes and solutions together, with consistent data models and integrated processes will become the key to success. Here the HANA integration layer (HCI) and the degree that integration is “out of the box” becomes central to the speed of benefits delivery. Organisations will find their own path, many may take a number of smaller steps within any of the phases above or even skip a phase entirely. Those that recognise the choices that are now available and plot a route which maintains the integrity core planning processes whilst leaving room to benefit from new capabilities as they mature will find the journey most rewarding. Olivehorse Consulting specialises in the delivery of advanced SAP supply chain planning tools. Combining experience of deployment of SAP SCM tools in some Europe’s largest and most fast moving supply chains and market leading IBP services and capabilities, Olivehorse are ideally placed to help you plot your IBP journey.